Take a journey through the galaxy with these 5 games! 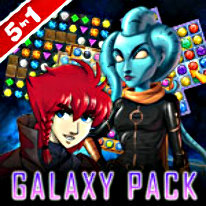 Embark on a thrill ride through the universe with the Galaxy Pack! In 2 Planets - Fire and Ice, play 140 levels of quite possibly the fastest match-3 game ever! 1000 LYA offers 80 levels of outer space match-3 fun. Rescue your missing partner in Galaxy Quest! Crisscross the galaxy on an interplanetary rescue mission in this one-of-a-kind match-3 game. Explore the colorful Jewel Venture universe and immerse yourself in a one-of-a-kind puzzle experience. With 10 different game variations and more than 1,000 levels, you’ll have ample opportunities to prove your puzzle prowess. Save life on earth and become a hero in Starlaxis, an innovative and exciting match-3/arcade mash-up.